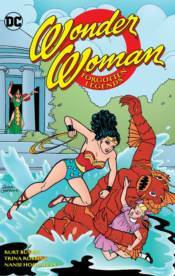 Tales of Wonder Woman in the style of the Golden Age of Comics by Trina Robbins and Kurt Busiek are collected at last! In these stories from the 1980s, Paradise Island is threatened by a mysterious Amazon known as Atomia! This title collects THE LEGEND OF WONDER WOMAN #1-4, WONDER WOMAN #318 and a story from WONDER WOMAN ANNUAL #2.